Available on Guero and 2 other releases. Available on Three Steps Beckwards. "Scarecrow" is a swampy blues song, a centerpiece on Guero. However, on the final Guero version, Beck edited the song way down. Basically Beck cut some of the transitions between verses, and the long "One Foot in the Grave"-like harmonica jam at the end was drastically cut. Many electric guitar licks were also wiped. My initial impression of the shorter version is that it feels much more cluttered and hectic, it doesn't have quite the same leisurely pace to it. Lyrically, the song pretty much has the same effect as the music. Beck was asked about the song and he said, "I think of it as robots on the bayou, down on the swamp. I had this whole image as we were making the song of this shack on the bayou, with the trees hanging down, alligators, a bunch of robots on the porch hanging out, watching the geese." The song also has an overwhelming feel of uselessness, with trick cards and illusions and digging the ground, going nowhere fast, and futile scarecrows who don't scare the crows. The earliest recording, from Feb 4 2005, of a live "Scarecrow" is also the first time Beck tried the song in public. Beck started the song with some eerie "ooh" falsettos, before the groove settled in. Beck's band sing along with him on all the verses. The beat is natural on stage, but it seems like a song that may fall apart easier than others. The harmonica is included, but it's not Beck playing unfortunately, one of his band take the harp duties. Also check out the KCRW version on March 31 2005, which is a terrific jam, and with the video footage, you can watch Beck get into his trippy guitar solo. Acoustic version = October 22 2006 = brings out the blues of the song. 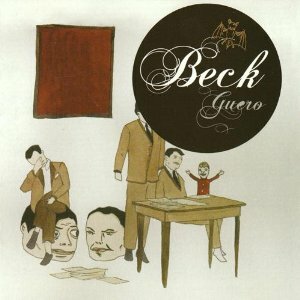 Beck has said that the idea of the remix, which he was all about for Guero, inspired him in that each song could be a skeleton for numerous versions. To that end, he went in the studio and recorded different takes of songs... the only specifics he mentioned was that they tried a "calypso version" of "Scarecrow" at one point!